Youth representatives of the European Trade Union Confederation and European sectoral trade union Federations met European Employment and Social Affairs Commissioner Marianne Thyssen on Thursday 21 January to push the Commission to pursue the funding the Youth Guarantee beyond 2016. The Youth Guarantee is supposed to offer all young people under 25 a good quality job, apprenticeship, traineeship, or continued education within 4 months of them leaving formal education or becoming unemployed. In future it needs to be better funded, and better implemented by all EU countries. The young trade unionists also told Commissioner Thyssen that the European Investment Plan should be increased, with more public money, to create more jobs, and include specific programmes for getting young people into work. While European trade unions support the Youth Guarantee it remains a problem that many EU countries have not implemented it appropriately, and are not using the funds available for it. 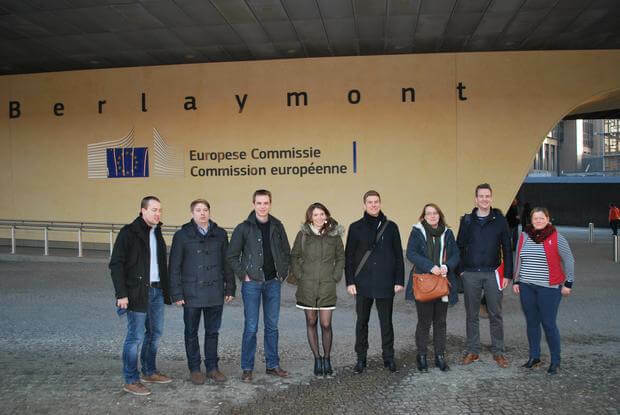 The trade union youth representatives which met Commissioner Thyssen were Thiébaut Weber and Tom Vrijens (ETUC), Cathrine Ertsas (UNI Europa), Inge Gielis (EFFAT), Michael Schuh (EPSU), Chiara Lorenzini (EFBWW), Sascha Ernszt (IndustriAll), Koen Reynaerts (ETF). The trade union delegation also stressed its willingness to be closely involved in the monitoring and assessment of the enforcement of Youth Guarantee schemes implemented through effective social partnerships as well as the needs to foster funding through the larger Investment Plan for the European economy. The meeting with Commissioner Thyssen followed the express request of the European labour movement to meet with her Services to discuss the Youth Guarantee implementation and propose concrete cooperation actions to render the Youth Guarantee a strong instrument granting young people the right to decent and quality employment. The demands of the European trade union movement concerning the Youth Guarantee can also be found here. * The latest Eurostat youth unemployment figures are for 2014.